It’s sunshine on a wool + silk blend. It is pretty spectacular indeed! What would you recommend as the best book and spindle for the complete novice with no teachers in the area? 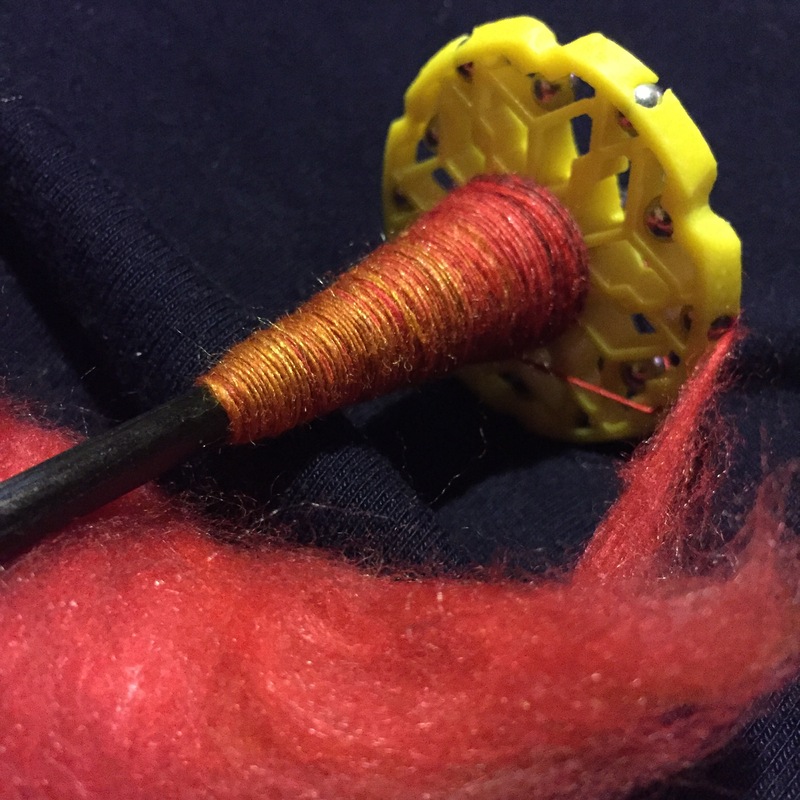 I have had a somewhat rocky start to my spindle spinning life, so I reached out to Mary Ann at Three Waters Farm — she’s amazing!!! and has helped me with many a spinning question over the last year. She recommends a basic top-whorl spindle from Louet or Ashford. Many of them are under $20. She said weight doesn’t really matter so much, just don’t go with super light. I started with a 1.1oz Schacht Hi-Lo and it was fine. A little heavier might have been easier for me though. As for books, Mary Ann said Priscilla Gibson Roberts’ “Spinning in the Old Way” is good as is Abby Franquemont’s “Respect the Spindle.” I’ve used a number of Abby Franquemont’s spinning videos online and they helped me a lot.Go into it knowing that there will be a bit of a learning curve to it, but once you get it, you’ll fly! Let me know how it goes!!! Thank you for the info! (Sorry so long to respond–in the hospital) I have been looking and looking again at “Respect the Spindle.” Haven’t seen “Spinning in the Old Way.” Kind of crazy, but I have this idea of collecting cotton that falls off the trucks during the harvest here in Alabama this winter/fall and spinning it. Maybe if I start practicing now I’ll be ready next year! Interesting! I’ve never spun cotton before. Best of luck!